cutworm, Deceit Perfume, Hex-Vic, Jimmy Durante, nose, odorant, perfume, plant communication, plants can smell, sense of smell, smell, stink bombs, tomato, U. S. Government Standard Bathroom Malodor, Who-Me? Smell happens when odorants—airborne molecules—attach to sensory receptors inside the nose, triggering an electro-chemical reaction that the brain interprets. Dogs’ sense of smell is far better than humans, partly because they have more odor receptors in their noses. Ants, too, are good smellers. They have 4-5 times as many receptors in their noses as most other insects. Except that insects don’t really have noses at all. Their smell receptors are housed in their antennae. The United States Department of Defense is turning its attention to the favorite pastime of many little boys. They’re creating stink bombs. The quest is on to find the most repulsive smell in nature and to mass-produce it chemically. It’s already been thirteen years since the U. S. announced the development of what it still considers the ultimate stink bomb. It contains two solutions. One is called U. S. Government Standard Bathroom Malodor. It smells like a filthy latrine, only much stronger. The other is called Who-Me? It’s made largely of sulfur and smells like rotting carcasses. Because people from different genetic backgrounds and cultures are attracted and repulsed by different smells, U. S. Government Standard Bathroom Malodor and Who-Me? had to be tested on volunteers from around the world. Everyone hated them. Stench can also be used by the military as a decoy. For example, during America’s Civil War the union army used the odor of burning wood and the sound of banging in wooden barrels on the banks of the Tennessee River to convince the Confederate army that boat building was going on. So the Confederate army turned its attention to that area of the river, and the Union army crossed at another. Iran has developed a “Deceit Perfume” that masks the odor of gunpowder with weather-related scents. One bit of big news in smell these days is that plants do it. Sure, many flowers smell good. But many plants have a sense of smell. Remember that in animals smell happens when an airborne molecule attaches to a sensory receptor in the nose, and this triggers an electro-chemical reaction that passes all the way to the brain, where the “smell” is interpreted. With plants, one plant emits an airborne molecule and even though it lacks a nose or an antenna, another plant has a receptor that receives it. There’s no brain in a plant to interpret the smell, but the smell does cause a reaction. In fact, smell seems to be how plants communicate with each other. And at least one topic of conversation for them is an alert that they share about the arrival in a garden of pests. 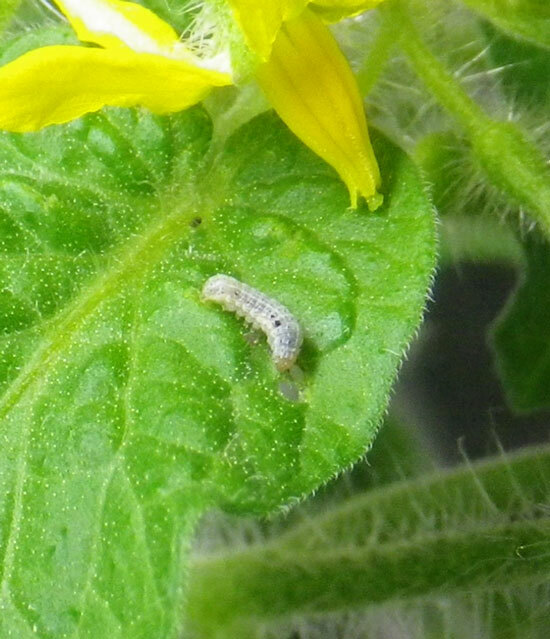 A common cutworm feeds on the leaves of a tomato plant. Image courtesy of Junji Takabayashi. For about 15 years now scientists have known that, for at least some plant species, when one plant comes under attack by insects it can emit a chemical scent that warns other plants to build up their chemical defenses. Tomato plants, however, not only send out the alert by smell. They share defenses that way. In March of this year Japanese scientists put two tomato plants in connected chambers. One plant was infested with cutworms. (It’s a kind of caterpillar.) Immediately downwind in the connected chamber was an un-infested tomato plant. The scientists assumed that, if the two plants were to talk by smell about cutworms, the downwind plant would start building up a chemical defense before the caterpillars got to it. As a control, the scientists put two un-infested plants in connected chambers, one downwind from the other. The researchers assumed that these plants would have no infestation to talk about. Later, the scientists directly exposed both downwind plants to cutworms. The cutworms on the plant that had been “told” by smell of the coming infestation didn’t do very well—because that plant had covered itself with the natural chemical (Z)-3-hexenyl-vicianoside. It’s nickname is “HexVic.” The control plant was not covered by HexVic, and didn’t fare nearly as well fighting the cutworms. When the scientists actually fed HexVic directly to the cutworms, it killed about 17% of them. But here’s the really exciting news. HexVic is actually part of the warning airborne molecule molecule sent from the infested tomato plant to the one downwind of it. So that smell not only encouraged the downwind plant to produce HexVic. It gave it some. The plants were sharing resources. So what do we mean when we say “talk to your plants?” And why should we think they need to hear us? Evidently, some of them are chatting it up already.